Easy Appetizer Recipe: Goat Cheese–Citrus Stuffed Endive! / Hey, EEP! 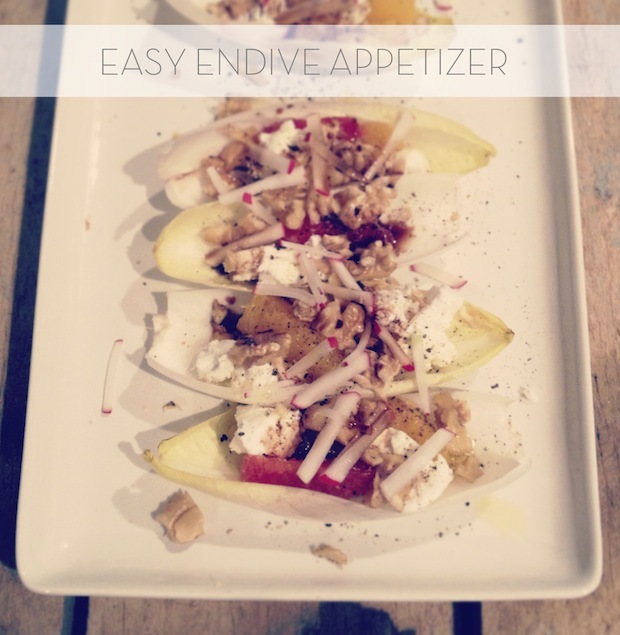 Easy Appetizer Recipe: Goat Cheese–Citrus Stuffed Endive! 1. Toast the walnuts in a dry skillet over medium heat. Let cool slightly, then coarsely chop. 2. Peel the oranges with a paring knife, cutting along the natural curve of the fruit. Hold an orange over a large bowl and cut along both sides of each membrane to free the segments, letting them fall into the bowl. Squeeze each empty membrane to release the juices. Repeat with the remaining oranges. 3. Fill the endive spears with orange, radish and goat cheese. Sprinkle with the toasted chopped walnuts. Drizzle with olive oil and balsamic vinegar. Season with salt and pepper.